Mr. Popularity: What do these two have in common? Apparently, a lot more than I possibly imagined. This realization did not settle my stomach any, but it has allowed me to make sense of the Tebow phenomenon unlike anything else before. Both are portrayed (or portray themselves) as squeaky-clean choir boys. And while I cannot confirm this, I am pretty sure both wear purity rings. Both have half-decent footwork and moves…for white boys. Females and casual fans alike, who typically know nothing (or care) about performance in either profession, inexplicably fawn over them. Neither were born in America (yet somehow, Americans still love them). Parents say they are good role models. In fact, many will likely pull their children out of school to begin vocal and dance training in hopes of becoming the next Bieber, or enlist their young in regimens of simultaneous weightlifting exercise, Pop Warner football, and bible study to become like Mr. Tebow overnight. Most importantly, there is no middle ground–you either love them or hate them. Not because of what they do onstage or on the field, but because of their constant invasion into our daily lives. Granted, it’s not entirely their fault. The blame lies with the media, who never hesitates to shove their cash cows in our face at every possible opportunity and laughing all the way to the bank. For those of you who actually care about football and made it to this point without closing the tab to go read another freakin’ story about Tim Tebow, here are my predictions for this weekend’s games. After finding myself having to cheer for Pittsburgh in a most unnatural fashion, I wondered whether pulling for a team I really dislike (moreso than even Denver) is really worth it if only to hope for the demise of the Great White Hype in Denver. Well, I nearly relented this week because I cannot bring myself to root for New England–or any other team from Boston–ever. Then somebody was voted Mr. Popular, setting the stage for what will surely be a sloppy one-way love fest on Saturday night when the American media has their next chance to shove Tebow down their–and our–throats. Rather than pulling for a hilarious Pats meltdown featuring Tom Brady screaming at his offensive coordinator and another appearance of the Bill Belichick Mad Face, I have no choice but to hope and pray that the Broncos are beaten by any means necessary, because…I. Cannot. Take. Any. More. This is the game I am most excited to watch. I have loved the San Francisco 49ers for as long as I remember watching football. I really like the New Orleans Saints, having spent a couple of years living in the Crescent City. I’m not going to bother breaking this down too much. We’ll hear about San Fran’s inability to score touchdowns in the red zone, which is an accurate assessment. However, to beat the Saints, the offensive game plan will have to allow Alex Smith to play more aggressively against a mediocre New Orleans defense, which is a dicey proposition. Yes, I’m torn, but I will be wearing my Joe Montana jersey and hoping to see the Niners register their first playoff win in almost a decade. Prediction: SF controls the Saints running game, forcing Brees to attempt over 40 passes. Niners capitalize on a turnover and take down Drew Brees and the Saints. 49ers, 27-21. Houston looked quite impressive last week, but then again, they beat a Cincinnati team that proved they don’t belong in the playoffs. Going into a rocking M&T Bank Stadium in Baltimore will be too much for the Texans to endure. The Ravens will shut down the running game of Houston and rookie T.J. Yates will crumble in one of the toughest environments to play. Flacco won’t impress, but he’ll do enough to advance Baltimore to the conference championship. Rounding out the weekend’s contests is what might be one of the better match ups. Ah, what can I say at this point in the article. How about: the Green Bay Packers have to be the most underrated, least-mentioned team to go 15-1 in dominating fashion. Why is that? Oh yeah, because Tim Tebow is god incarnate. Prediction: Giants will keep it close early on, but Green Bay pulls away in the second half to a victory. Packers win 31-17. Final prediction: Tim Tebow coverage will be smattered all over ESPN, FOX, CBS, NBC, NFL Network, CBN, and CNN throughout the entire weekend–win or lose. Double or nothing says he’s on the Republican ticket as Vice Presidential candidate. This entry was posted in Sports and tagged Denver Broncos, Justin Bieber, NFL, playoffs, Tim Tebow by Troy Beckman. Bookmark the permalink. I’m very surprised the Patriots are 14-point favorites, but you make a good case for why they will blow out the Broncos. Good stuff! 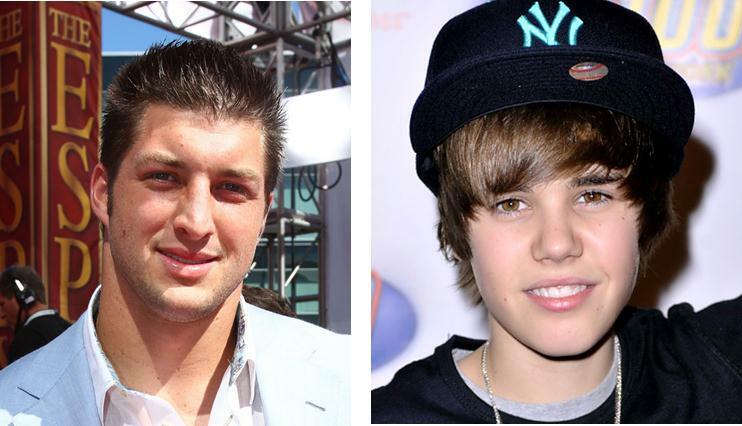 Looks like Bieber’s 2012 will be off to a better start than Tebow’s. God, what a mess he left in New England. Just what his critics needed to start up all over again…and rightly so. I don’t think for a second John Elway and John Fox are sold on him long-term…or even next term.